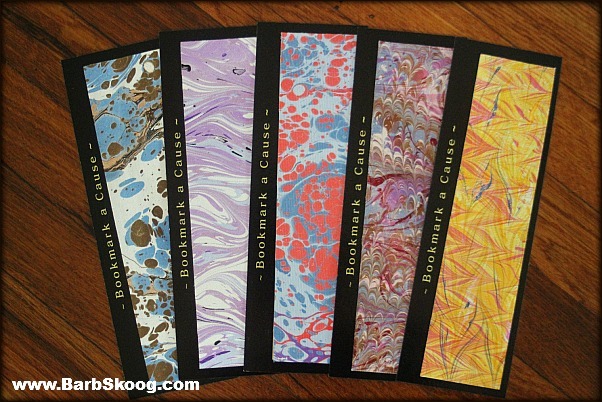 I am so, so excited to share with you my latest project: Bookmark-A-Cause. For over a year I've been trying to figure out a way to tie my artwork into a charitable cause. When I ran Hope's Flame ("candles for those who believe a little hope can go a long way"), a portion of all of my sales went to one of three non-profit organizations I passionately supported. It was an easy and natural fit ~ candles and charity. But with my artwork, simply saying a portion of sales went to a great cause felt very forced. People buy art because it speaks to them, not because they want to support a charity. And my artwork is a different price point than my candles. People might by a $10 candle just to support a cause but they are not going to buy a $150 piece of art just to support one. This summer, a friend of mine had a book published and she approached me about making bookmarks she could give away as gifts. I mocked up a few ideas but in the end she decided not to do it. However, I was left with a handful of great bookmarks and as I started to use them myself, I felt pulled toward the ones I made using canvas. 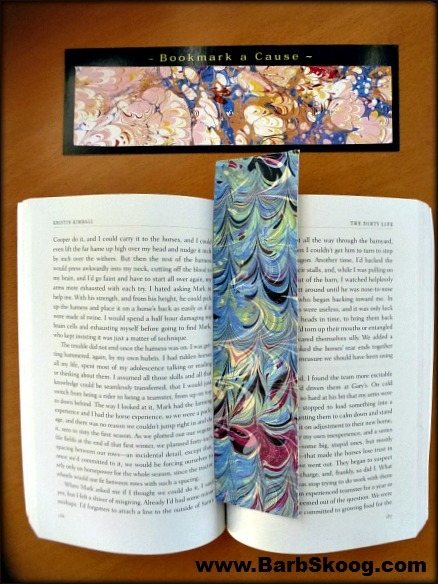 And that's when it hit me ~ hand-marbled bookmarks + non-profit organizations = A WIN! I had found a way to align my work with a cause. And it felt very right. I love marbling on canvas but it does have its challenges ~ the larger weave makes it difficult to marble a delicate or more intricate pattern or design. Instead, I tend to marble what I call "movement" designs ~ images that create a sense of fluidity. I also do a lot of overmarbles to add depth and texture. As a larger piece, I'm never a fan of my canvas creations, but when I cut them down to bookmark size (2"x8"), they are fantastic. As the saying goes, "the devil is in the details," and wowzer, if that isn't true with these bookmarks. Sometimes I find myself staring at my bookmark instead of reading my book! My first round of 100 bookmarks will be available at the South Pasadena Arts Crawl this Saturday, March 8. They are $5 and proceeds benefit SPACE Arts Center in South Pasadena. 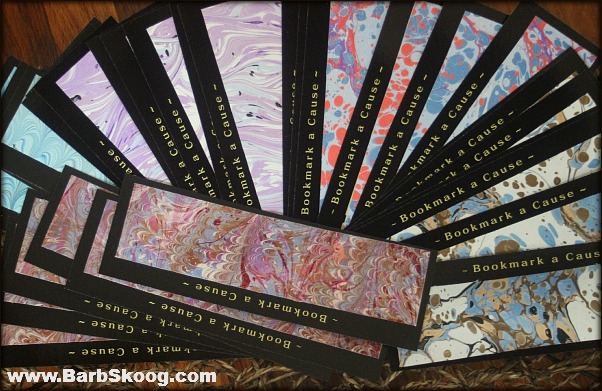 I'll have them at Book'em Mysteries Bookstore (1118 Mission Street) where I'll be doing my marbling demonstration from 6 p.m. to 9 p.m. They will also be available at SPACE (1506 Mission Street). And I would be terribly remiss if I didn't mention that all the canvas is being donated by Artist Brand Canvas, a family-owned and operated company selling stretched canvas to artists for over 43 years. All their materials are American made and their wood is sourced from a company using sustainable practices. And remember how said marbling on canvas has its challenges ~ well, their canvas is the ONLY canvas I have been able to marble on 100% successfully. It is such high-quality ~ with no fillers or crappy chemicals that interfere with the binding process (which is the main problem with other canvas...the paint slides right off!). I'm not getting paid by them to say this. 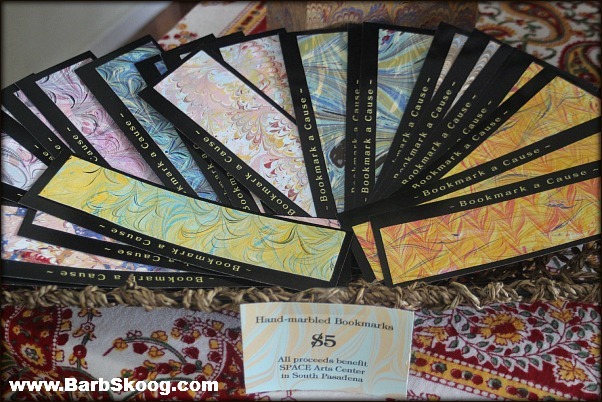 I truly believe in their product and am THRILLED they are part of the Bookmark-a-Cause family!